When a tooth is lost, it affects more than the appearance of your smile. We rely on our teeth to help us bite and chew our food, and give us the ability to speak properly. Missing teeth can lower your self-confidence, punching a hole in one of the first things people notice about you. Immediate: Created and put in place the same day as teeth are extracted. Permanent: Tailored, fitted dentures designed for comfort and function after you’ve healed. Implant Supported Overdentures: Snap or screw onto implants for stability and comfort. 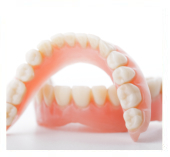 Partial Denture: removable appliance to replace a few missing teeth. Ultra Suction: Uses a series of air valves to securely hold the dentures in place. Flippers – temporary replacement dentures. These are usually intended as a placeholder while a more permanent denture is fabricated. With high quality materials and the best dental technology available, our dentures are more realistic and comfortable than the bulky old-fashioned appliances. Nobody will be able to tell that they aren’t your natural teeth, and you might even forget you are wearing them. You don’t have to let missing teeth affect your life. Dr. Shirley Baker is a cosmetic dentist in Tijuana who can help create a perfect denture for you. To learn more about the options available to you, call Tijuana Clinic for Cosmetic Dentistry at (619) 971-2297 today to set your appointment.